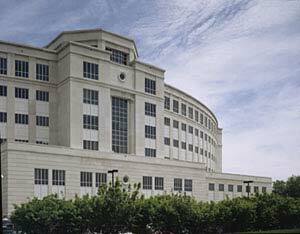 In October 2002 the Michigan Supreme Court moved to its permanent quarters at the Michigan Hall of Justice. The journey from the informal meeting places of the early Court to the stately confines of the Hall of Justice is an interesting one with many twists and turns along the way. As early as 1922, the need for a judicial building to anchor the west end of the capitol mall in Lansing was recognized. In his 1922 city plan, Harland Bartholomew drew in a stately court building that faced the Capitol. Forty-five years later, in 1967, Chief Justice John R. Dethmers expressed the hope that “the long continued assurances from some quarters that one day this Court will be housed in a new court building may before long come true.” Unfortunately, it wasn’t for another 32 years that the promise of a home of its own finally came to pass. 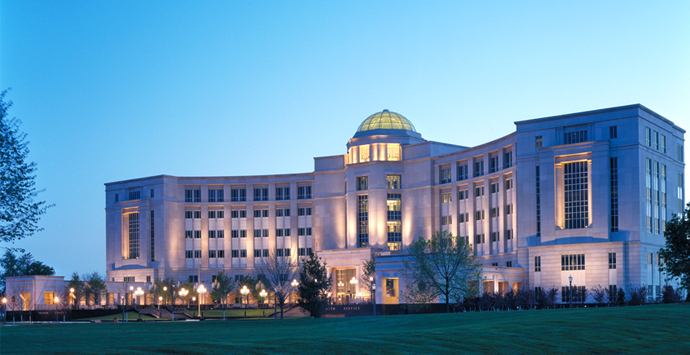 The Michigan Hall of Justice, the first Michigan building to be entirely dedicated to the judicial branch of government was dedicated on October 8, 2002. Read the transcript here. 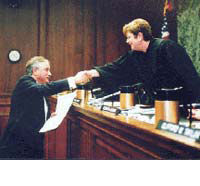 The groundbreaking ceremony for the Michigan Hall of Justice was held on October 12, 1999, and the building was dedicated in grand fashion on October 8, 2002. The building, designed by the architectural teams of Spillis Candela DMJM and Albert Kahn Associates, Inc., was constructed by the Lansing-based Christman Company. “We put those four words up without explanation or even an apparent order because we wanted them to invite reflection. Four words that a teacher can use asking students what they might mean. How they might relate to each other. Which one might be the foundation of which other. We want the students of this state to be active participants in justice and in thinking about justice before they even come in the front door. But I can tell you what those four words mean to me. Freedom is the oxygen that we breathe in this country. It is the core value of our Constitution as reflected in the First Amendment guaranties of freedom of speech, freedom of religion and freedom of assembly. It is the essential element that brought so many of our ancestors to these shores and it is the essential element for which some of our African-American ancestors would gladly bear the risk of coming north to these lakes by the underground railroad. In freedom we can seek truth. From Aristotle to Aquinas to Einstein to your daughter in graduate school, the human adventure is a quest for truth. In the marrow of our bones we hunger for truth. And when we accept truth we recognize equality. “…was conceived in the grand tradition of City Beautiful planning. The unabashedly monumental and classical overtones of the project are intended to provide a distinctly permanent and durable image for the Michigan judicial system in this age of fleeting impressions and momentary pleasures. On the ground floor of the Michigan Hall of Justice is a 3,800 sq. ft. public education center designed to introduce children and adults to the Michigan court system. This one-of-a-kind, interactive gallery is the result of a concept proposed by then-Chief Justice Elizabeth A. Weaver. The Learning Center, which is designed for students from the fourth grade to adults, and the gallery are filled with activities including an introductory video, computer programs, push-button programs, and traditional wall text panels. The Center opened its doors to the public on November 1, 2002, and hosts about 10,000 visitors per year. 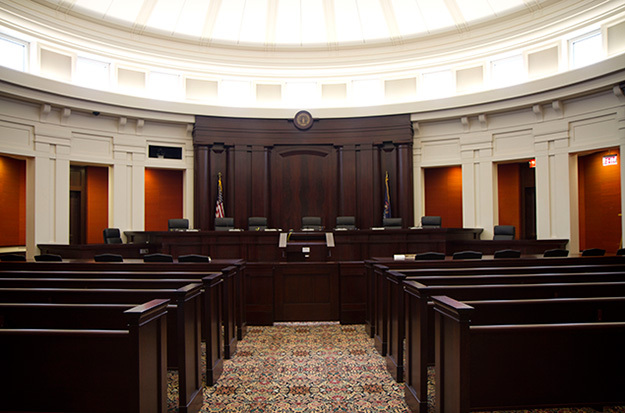 The Courtroom in the Law Building was functional and plain, featuring maple paneled walls and a maple bench with a backdrop of ¼ inch green marble. There were four maple attorney tables, a walnut podium, and bench seating for 80 spectators in the back of the courtroom. Click Here for more information about the architecture and history of the Old Supreme Court Chambers. 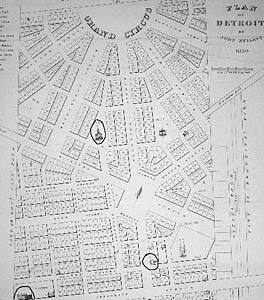 This map of early Detroit shows three early meeting places of the Territorial Supreme Court. 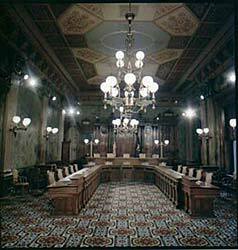 On July 24, 1805, the first Supreme Court of the new Michigan Territory was created. 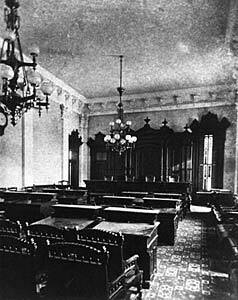 As the seat of Territorial government, Detroit was the site of the earliest sessions of the Territorial Court. Reflecting the pioneering spirit and adventurous nature of its constituents, the Court’s early meetings were often informal and sometimes even a little raucous. 1 Gilpin, Alec R., The Territory of Michigan 1805 – 1837. Michigan State University Press. East Lansing, MI 1970. 6 Dunbar, Michigan Through the Centuries, Vol. 2., pg. 543. 15 Dedication of An Historical Marker Commemorating the Old Supreme Court Courtroom 1879-1970. 430 Michigan Reports. 16 Dedication of An Historical Marker Commemorating the Old Supreme Court Courtroom 1879-1970. 430 Michigan Reports. 17 A Portfolio of Michigan Capitol Woodcuts, Reprinted from the February 15, 1879 ISSUE OF Harpers’ Weekly by the Michigan Capitol Committee and the Friends of the Capitol, Inc.
19 Capitol Courtroom Closing. 383 Michigan Reports. 20 Michigan Supreme Court Special Session Court Closing Ceremony. 466 Michigan Reports.